Usually FREE WORKOUTS only happen in the summertime. 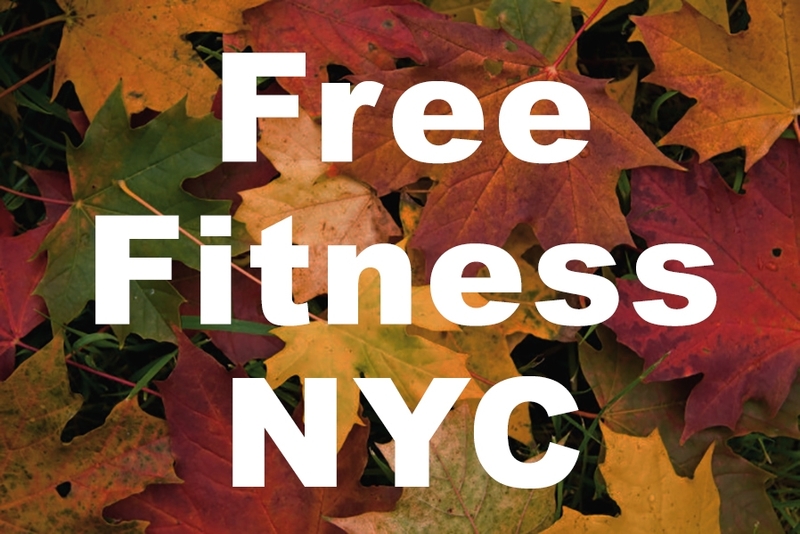 But fall is bringing it with this list of free fit events happening in New York City. I will be attending as many of them as I can, especially the one I'm hosting. Just make sure to sign up for the events you definitely want to attend ASAP. All of these promise to fill up. Sept 10th - Girls' Night Out with New Balance hosted by ME! Girls' Night Out (a.k.a. #nbgno) was at it all summer with a series of events aimed at social fitness for empowered ladies. If you read my site regularly, you'll know that it was a major success and the highlight of my summer. In celebration of fall fitness and snazzy NB activewear, Girls' Night Out is doing another event in NYC featuring the popular rowing workout by City Row. RSVP NOW and mark your calendars for Wednesday, Sept 10th at 6.30pm. The event starts at the New Balance Experience Store in Flatiron and will migrate over to the High Line (with a run) for some high-intensity rowing. As always, the night ends with gift bags (skincare goodies from BLISS) and includes drinks/health snacks. Not baaaaad. These are all pretty tough workouts, best done outside with a nice breeze on Pier 46 at Hudson River Park. SIGN UP HERE to reserve your spot. I recommend Barry's and The Movement but Brick is like asking for a ton of bricks to be thrown at your body the next day. Unless you're a Crossfit lover, I'd say pass on this class and torture yourself with the 2 others. Then again, my body rejects Crossfit like the plague. Have fun! I might be Wanderlust Festival's biggest fan. Personally, I'd love to work for the company some day because I don't think there's another festival on the planet that's run better. Wanderlust started off as a mind-body-music festival for yogis and over the years has evolved into so much more. This fall, on Saturday, Sept 13th they're blessing Brooklyn's Prospect Park with Wanderlust 108. Wanderlust 108 is a 1-day long festival (unlike their other world traveling weekend festivals) that includes a 5K run, an inspirational speaker, guided meditation and a massive outdoor yoga class. The meditation and yoga class is absolutely FREE! The 5K run requires a ticket. But you probably didn't want to run anyway. Leave it to the crazy cardio girls like ME to do that (yes, I'll be running and could use an entourage if you're down). National Yoga Month is always a breath of fresh air...and an exhale of everything you need to LET GO of. Thank God for Exhale's yearly celebration of this holiday. I'm an Exhale member (I go 2x/week) so I'll warn you that I am completely biased, but they're amazing! Yoga classes at Exhale get me through my week intact. And now you can experience it yourself for FREE! Exhale in partnership with Marie Claire has named Thursday, Sept 18th, namasDay. What this means for you is a FREE evening yoga class at one of many Exhale locations in NYC and throughout the country. Different types of yoga will be offered: Power, Flow and Chill. Only select class times have been named namasDay classes so be sure to look them up and RSVP HERE. If you live in NYC and want to join me on namasDay at Exhale (Central Park West location) for a special lunch hour yoga session, EMAIL ME HERE. Otherwise, expect these classes to take place in the evening. There you go--your fitness fix for fall that won't cost you a penny. Thank me when you're sore!